It's been another one of those quilt the world weekends. Two monster quilts are now ready to return home. A third has just resisted me though. The backing isn't big enough. I am glad I checked. It was a quilt I took in during a class and I trust the maker so I didn't check the measurements. The quilt is a king size, so was going to be a tight fit on the backing whatever the case, sadly when the backing was prewashed it shrank enough that it will no longer fit the top at all. Yes it can be fixed, yes I should have checked it. Still right now I feel thwarted by the quilt. I am glad I decided to check the measurements before I started, if not when I took the quilt in. 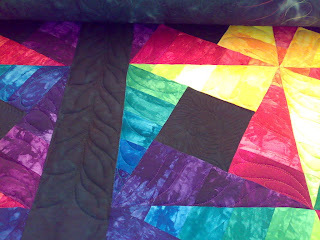 Now I think I will tackle some of the smaller quilts I have waiting for a change. There seems to have been a run of huge quilts the last few months. 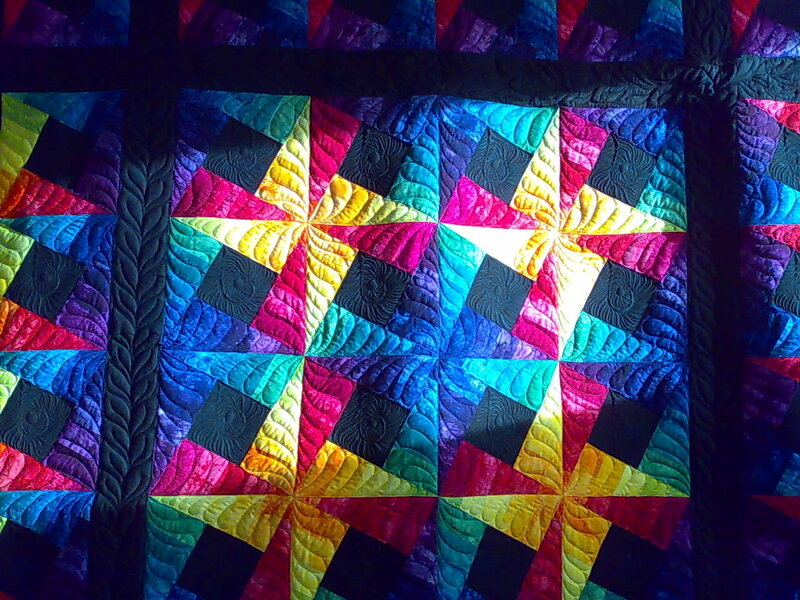 Maybe quilters are doing their bit to save energy and reduce global warming. It is much better to have an extra quilt on the bed rather than turning up the heating. Speaking of which, I think it might be time to find the hot water bottle. Last night my brain started itching, it does that. Something wanted out and I couldn't quite see what. It was a jumble, with the holiday quilt playing a part and star and shading and well stuff. So I tried looking through the books I had been looking at just before and after the Festival of Quilts as all the other stuff seemed to fit that time scale too. There were some ideas, but none wanted to be a quilt yet and none were the problem. It finally came to me just as I was falling asleep. Oh my it's going to be fun, and mammoth. Tet has spent a lot of today getting it down on paper for me, as it would have been a nightmare to draft by hand and less trouble by machine. Now I am excited, I think it will be a good quilt. I have enough fabric to start it (although the fabric to finish it is only just on it's way) and I can't wait to start. Sadly I still have a couple of customer quilts that need to be quilted before Christmas so I should do them first, but at least I have a plan now. I don't know how long it will take, but I don't think it will be quick. I will be largely keeping this one as a surprise, but it will be a bed quilt, fairly traditional and very me. Yay, the guys did their job, and quickly. I'm back up and running. Here's the monster finally quilted. It's too big to get a good picture of without moving the furniture, and as my class will be here any minute that isn't going to happen. I am really pleased with how it has come out, but I think Tet is perhaps too pleased. Rather than going straight on the bed this will be doing some shows first. Oh well can't win them all. I guess this will be an on going problem, either I do poor quilting on my quilts or I will have to wait to use them. I guess I can live with waiting. I am feeling well enough to make some progress on quilting my holiday quilt. This is the best picture I managed to get of it. I will try again tomorrow with natural light it might help. I am using my Aurifil thread for the first time and I am loving it. I have their 50 weight in the bobbin and the 40 in the top. I am testing with a view to using it on art quilts so I wanted to know that the fine threads would work. I had a few glitches to start with but the tension didn't need a lot of adjustment to run really well. I am running it almost flat out a lot of the time with no issues. There is a different colour in each area to make the texture talk louder than the actual stitching, so it is quite hard to see the thread on most of the fabrics. The wadding in this quilt is actually two waddings. Closer to the backing I have Warm and Natural, a nice dense cotton wadding. It has enough structure to encourage the puff of the top wadding to the front of the quilt and make it look fuller. The wadding closer to the top of the quilt is a wool wadding. I love wool, for it's temperature control and loft, but I don't often put it in quilts for me to use. This is a real treat, and a very useful sample. I've been able to play on this without worrying too much about it. If nothing else it gave me something safe to work on while I have been ill. It's not been the quickest project with so many starts, stops and colour changes, but it's fun. I have made it through my last talk of the year, yay! I've been determined not to get ill and have to cancel any so that worked. However, as soon as I said 'Yay that's it for the year' I got ill. So I have been doing not very much. I loaded my holiday quilt and have played on that (and unpicked then tried again) I know I can't quilt for customers when I am under the weather. I can't be trusted with anything that needs a brain. You should have seen my trying to sort out next terms workshops this afternoon. I couldn't remember the last thing I had said let alone what date we were talking about. However I will hopefully be more on the ball tomorrow and we will get things arranged, then there will be a mass updating of my web site. Having been ill since Saturday night I have high hopes I am on the mend and will be back on form for Saturday. I have so much I want to blog about but somehow I can't quite get my thoughts together. So what have I been up to? Mostly driving. Monday night I went to Icknield Quilters with a side trip to Crafty Quilter. I wasn't honestly expecting much, sorry. The photos I had seen looked small, and I like everything BIG. What the pictures don't show you is context. The shop is in a wonderful old mill at Barton-le- Clay. 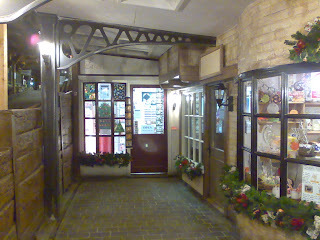 It is one of a whole street of period shops. It's like stepping back in time, just lovely. The shop is small, but the space is very well used and the fabrics well worth the trip. You will find ranges there that no one else has. They also stock Glitter by Superior threads. It you have taken a machine quilting class with me you will have seen it. It is a smooth filiment and runs surprisingly well on a whole range of machines. I haven't checked to see if it is on her web site, but I am sure if you phone (or better yet visit) they will be happy to supply it to you. Tuesday was a trip in the opposite direction, Gosport. Having lived in Portsmouth for a while and grown up by the sea I was rather looking forward to this one. Hmmm, well. An accident on the M27 at 3pm shouldn't stop me getting to a talk at 7pm should it? No, but it did. I had left over 4 hour to do a 2 hour journey but it took over 5! I can't say it was the best or most organised talk (I am glad I take care to repack in order) but it seemed to go down well. The class the next day was great. A really fun group who were keen to support each other, and an ideal place to observe the 2 minute silence. Today I am back with my regular trouble makers, the ladies who put together the requirements for the book quilt. I've photographed all the quilts I am returning tonight except for the two that have already gone. I know those will get photographed at some point. Having almost extracted my gaming table, I've taken in more quilts to fill it. Oh well, it's good to have work to do, although I would like to play games too. Thank you for the concern folks, yes I'm still here. I've just been rushed off my feet. I had a couple of weeks where I was starting to wonder if I still had a house. I do and it still has a longarm in too. On one hand it is good to be so busy on the other I have been missing home cooked food and the chance to do my laundry. When I see an M&S on the way to a talk and think great, clean clothes, something has gone wrong. Still I've had a productive weekend and I am feeling much better. 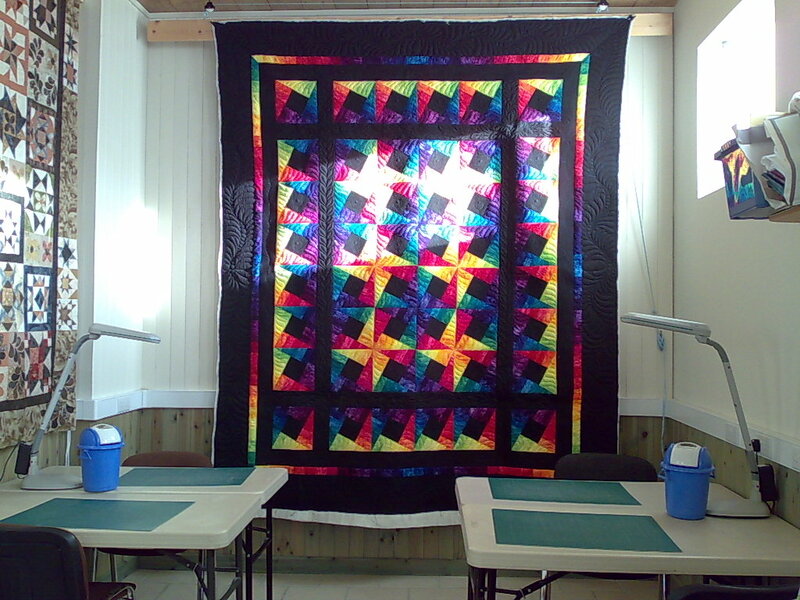 The washing has been done, food has been cooked and eaten and I even got to do some quilting. It's great seeing the pending pile shrink and the return pile grow. Unsurprisingly, given the time of year several quilts have had a Christmas theme. They tend to need a bit more thought and take a little longer, but they always look so interesting when they are done. I rather like them. At the moment I have one with angels on the frame. The angels have trapunto wings and I am making them more trapuntoed. They are really coming to life and hopefully I will be able to do the last two before I head off for tonights talk. However before then I aslo have to repack the car and go to the storage unit, so I may not get there. I am almost caught up on email too. I think I am down to 6 left that need replies. I haven't forgotten you I am fitting in repluing whenever I take a break. I think I have replied to more than 20 already since Friday and I will keep at it to clear the rest. 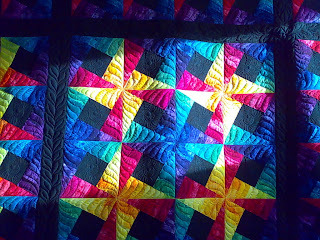 I will try and get pictures of some of these quilts before they go back too. 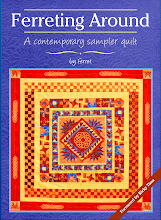 Oh and Popular Patchwork December issue has a pattern of mine in, for journal quilts. It also has a very nice review of my book. 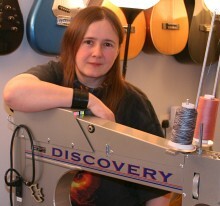 My book and several other things are available from my online shop at Ferret Fabrications.